John Wayne fans, take note. 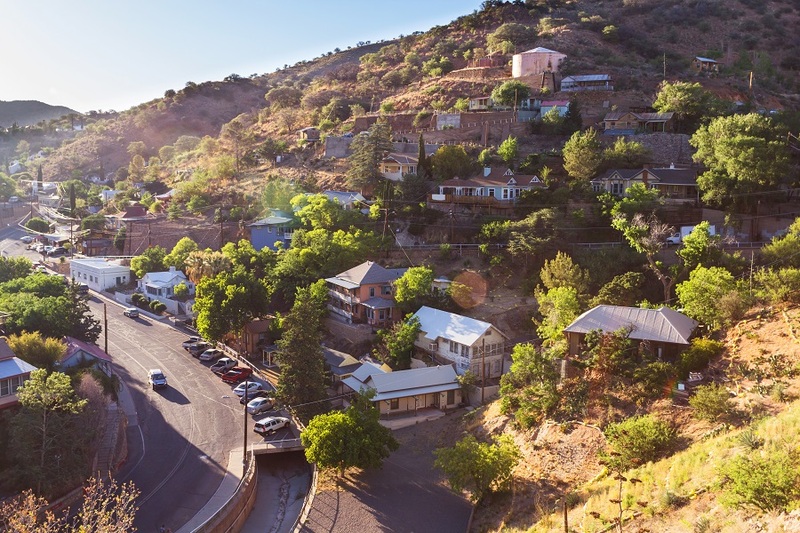 There may be no better travel destination in which to soak up the old Southwest than Bisbee Arizona. Settled against the Mule Mountains, this quaint artisan town offers a diverse experience whether you’re a foodie, history buff, or simply someone who appreciates curling up in the corner of a bookstore with a hot cup of coffee. Just 90 miles south of Tucson, tourists and Arizonans alike will find Bisbee well worth the drive for a glimpse into what life was like in the late 1800s when copper mines and old saloons defined this charming city. Founded in 1880, Bisbee Arizona, earned its name from Judge DeWitt Bisbee as a nod to his generous financial contributions to the city’s most prevalent attraction, the Copper Queen Mine. You wouldn’t guess it now, but at the turn of the century, Bisbee was the largest town between San Francisco and St. Louis and home to over 20,000 residents. The city thrived for decades producing billions of pounds of copper, three million ounces of gold, and much to the delight of locals, more saloons than they could visit in a night. In the mid-1970s, Bisbee’s mine camps came to a close after rapid declines in profitability throughout the years due in large part to the open-pit mining expansion of the fifties. In an effort to preserve the infamous Copper Queen site and generate revenue, Bisbee’s mayor, Chuck Eads, worked to transform it into the tourism hot spot it is today. If you have a day or two to wander the city streets and engulf yourself in the historically rich nooks and crannies of this lesser-known gem, you won’t leave disappointed. Bisbee is known for having planted its artistic roots during its restorative phase as evidenced by numerous galleries such as 55 Main and the Sam-Poe Gallery, the latter treating tourists to colorful abstract paintings and sculptures created by the hands of a husband and wife. If you’re in the mood for live entertainment, head over to Bisbee Royale, an old Baptist church turned venue which has even the most seasoned online critics raving about its ambiance and style. The Bisbee Royale is not only a cinema but a live music venue, pub, and kitchen serving artisan pizza made with freshly-baked dough each afternoon. And what hundred-and-thirty-four-year-old town would be complete without a little haunted history? Visit www.oldbisbeeghosttour.com prior to your stay and find four different tours ranging from “ghost hosted” family-friendly adventures to self-led tours complete with ghost hunting equipment. Naturally, Copper Queen Mine is the city’s must-see attraction where visitors don hard hats and headlamps and take a mine train deep underground for a fascinating recreation of the very trade that gave Bisbee its character and story. Bisbee Arizona, might not be first destination that comes to mind when planning a unique getaway, but with its historic charm, modern shops and restaurants, and reasonably priced attractions, perhaps it should be.